A generous cone of Strawberry Fields Forever at Louisville Slugger Field. Gas prices have been too high to venture more than 15 minutes away from Ashlee Eats HQ, aka my Old Louisville apartment, so I haven’t made it out to The Comfy Cow in Westport Village. Fortunately, this local ice cream shop has spread its creamy confections to Louisville Slugger Field. Slugger Field and The Comfy Cow have entered a partnership this season that has left me smiling. The Comfy Cow is the official ice cream of the Louisville Bats. Local ice cream business plus minor league baseball? Yes, please and thanks. The Comfy Cow offers an abridged, rotating selection of flavors from its regular menu at the ballpark. Cake Batter Up and Mint Chocolate Chippy were two of the options that day. During a Louisville Bats home game last month, I bought a regular cone of Strawberry Fields Forever for about four bucks (my receipt got lost in the abyss that is my purse, so that’s an estimate). When you order strawberry ice cream from The Comfy Cow, don’t expect a bright pink ball of artificial flavor. 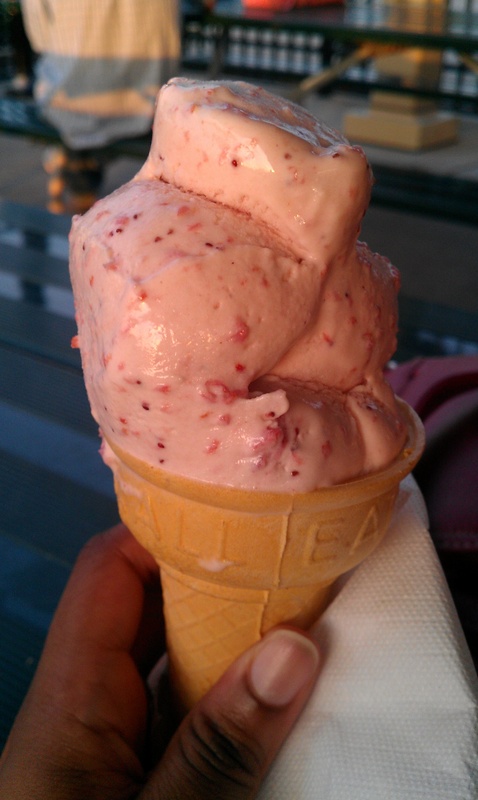 This was the freshest strawberry ice cream I had ever tasted. Bits of strawberry dotted the three hearty scoops of my cone. And for such a hot evening, the ice cream held up really well. I didn’t get a drop on my hands, which is no small feat for this messy eater. A trip to the ballpark is always fun. But the addition of The Comfy Cow makes baseball even sweeter. 402 East Main Street, Louisville, Ky.